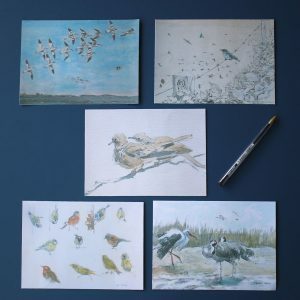 Three sets of artist’s cards are now available. 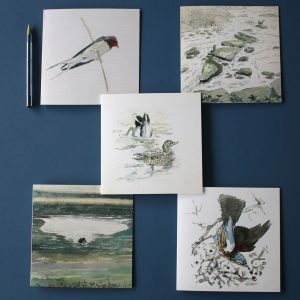 Featuring paintings and drawings by John Busby the Seabird and Mallard sets are 150mm square (6″sq) and the Collared Dove set is 13 x 18cm (5″ x 7″) They all come with their own envelopes, individually wrapped in cellophane bags and are blank inside for your own message. Payment by BACS or cheque please. Please email us through the contact us page if you would like a set. 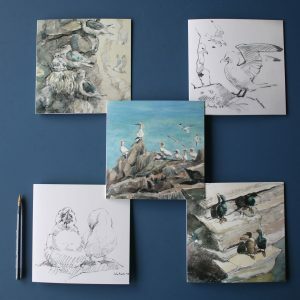 Seabird set: Kittiwakes nesting, Kittiwake sketch, Gannet Colony, Gannet and chick drawing, Shags at Craigleith. Collared Dove Set: Avocets, Stonechat above a Cornish beach, Collared Dove, Garden Birds, Stork and Cranes.